Sister Mary Rosita Shiosee beats a small drum as she leads an elderly congregation in song. Her voice is strong and warm and encourages her frail Massgoers to join in. Laguna Rainbow Nursing Center is one of the many weekly stops she makes on her rounds visiting and praying with people in Laguna Pueblo, N.M. The pueblo’s pastor, Franciscan Father Wayne Gibbeaut, said people call her “the flying nun” because she’s always on the go. “Some people just never stop,” he said. She was born, baptized and confirmed in Jemez Pueblo, 60 miles away as the crow files, and spent time as a girl in the village of Mesita in Laguna Pueblo. She still speaks her native Keres language, which has fewer than 8,000 fluent speakers. 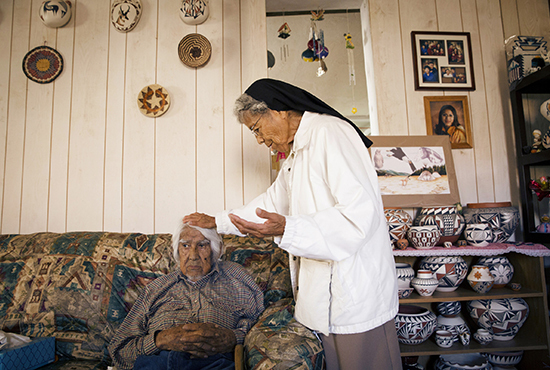 While visiting homebound people in Mesita, Sister Shiosee looks out over the village’s surrounding landscape. It is wild and barren now, but she remembers it as fertile ground, where the pueblo once tended fields of wheat, alfalfa, corn, chilies and other vegetables. “As children, early in the morning after the dew had settled on the dirt, we would go out and turn the dirt over. That’s how we would water the plants,” she said.Her mother died early, and the young Shiosee was sent to attend St. Catherine’s Indian School in Santa Fe. She said that in the fifth grade she discerned a call from God and entered her novitiate in 1954 on the feast of the Presentation of the Lord. “That day is special to me because it’s the day my dad offered me back to the Creator to serve him,” she said. Sister Shiosee studied in Louisiana and went on to teach in several mission schools in the West. Now, at age 83, she is back on the land of her ancestors, living near her only sibling and ministering to those most in need. Each week she takes Communion to 28 homebound members of the pueblo and also visits its senior center and inmates at the penitentiary. She has put thousands of miles on her car, driving paved and dusty unpaved roads of the pueblo. Although there are street signs — Coyote Drummer Road, Salt Cedar Loop — she ignores them. She knows where she is. That’s what she believes, too.